A more advanced generation of geodesic satellites, code-named Musson Eridan, was inaugurated with the launch of Kosmos-1312 from Plesetsk on Sept. 30, 1981. (66) The development of the system designated Geo-IK was conducted during 1977 and 1978 at the 50th TsNII of Space Systems within the Ministry of Defense and the 29th NII VTS research institute. (76) Tsyklon-3 rockets carried the 1,530-kilogram Mussons into 1,480 by 1,525-kilometer orbits with an inclination 82-73.6 degrees. 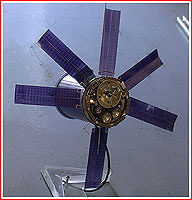 Among its payloads, the Geo-IK satellite included a special lamp, which could produce a cascade of nine powerful flashes of light with a frequency of up to 55 times a day. Like a similar device on Sfera, the lamp was designed to facilitate highly accurate tracking photography of the satellite in the night sky. The new system enabled the development of a global geodetic coordinate system, helped to clarify the shape of the Earth, its gravitational field and to establish geodesic relations between the different continents and islands around the globe. The information was expected to assist in the development of the USSR's global positioning system. 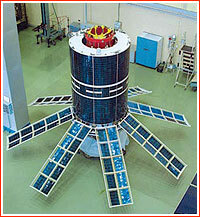 The last Geo-IK satellite stopped working on February 5, 1999. 2 Kosmos-1312 1981 Sept. 30 ? 3 Kosmos-1410 1982 Sept. 24 ? 4 Kosmos-1510 1983 Nov. 24 ? 5 Kosmos-1589 1984 Aug. 8 ?